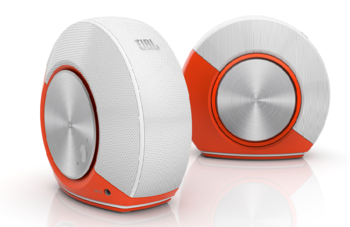 JBL has announced the distinctive looking Pebbles, a compact USB powered stereo speaker system for the desktop, with digital signal processing and SlipStreamTechnology. The JBL Pebbles plug-and-play stereo speakers are designed to connect to a computer in the quickest, most efficient way possible – via USB. The speakers are powered by one single USB cable to reduce desk clutter. The rotating volume control syncs up with your computer. Also, because your computer is not the only place you store your music, JBL Pebbles features an AUX-in port for your smartphone or MP3 player. The JBL Pebbles will be available from September for an approximate retail price of £49.99. For additional information on the JBL Pebbles stereo computer speaker system, or to purchase, visit John Lewis online, Richer Sounds and JBL.